Gee. 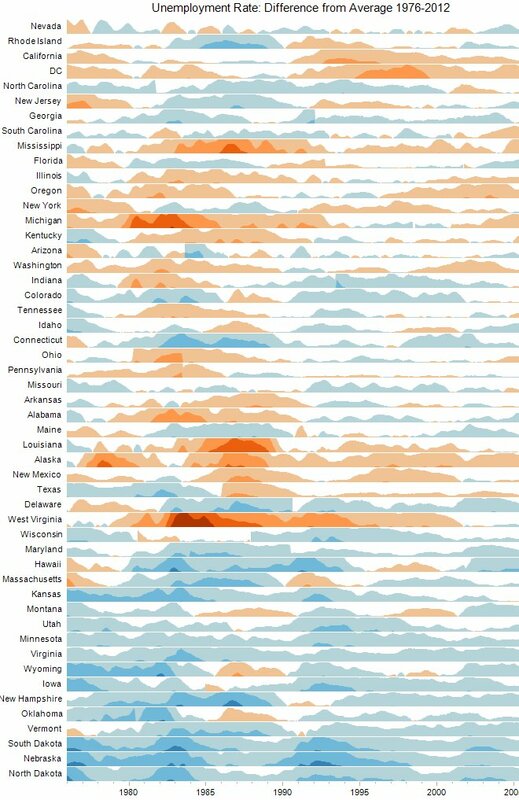 I'm flabbergasted that red states are thriving while Democrat-controlled Utopias are collapsing under the weight of public sector union control, endlessly ratcheted taxes, and ever-increasing regulations. Oh, wait. They don't give a crap. 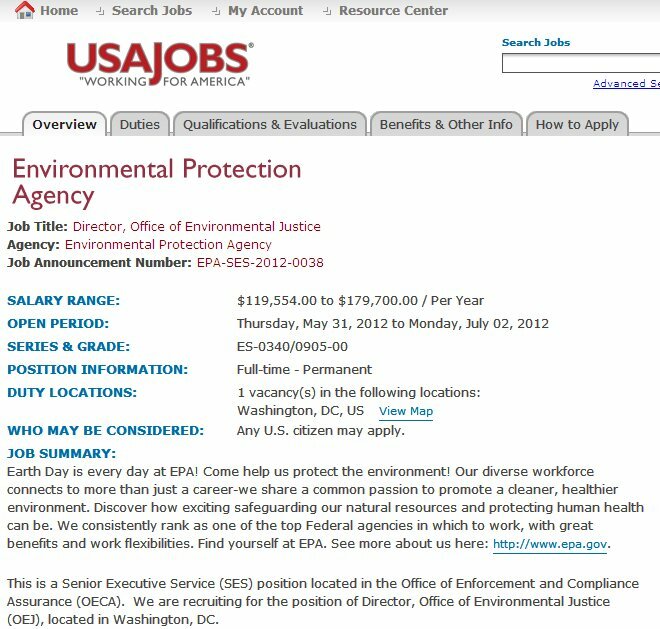 Your tax dollars at work: EPA hiring $180,000-a-year director of "environmental justice"
It's November or never to save this Republic. What can you do? If you have the wherewithal, support the most conservative candidates you can. Like Ted Cruz in Texas or Jim DeMint's Senate Conservatives Fund. My friends, we have work to do. 3 Possibilities: What convinced John Roberts to change his mind at the last minute and stab the conservative justices in the back? Last night Mark Levin said that he had finished reading the entire SCOTUS decision on Obamacare three separate times. 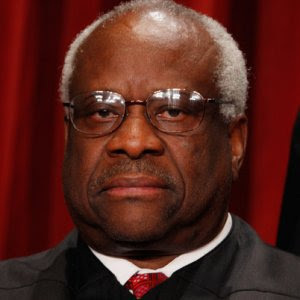 His conclusion is that "the Supreme Court is not a happy place." 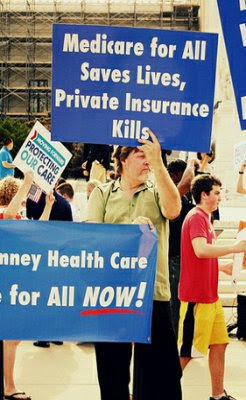 His believable claim is that John Roberts -- at the very last moment -- changed his vote that would have struck down both the Individual Mandate and Obamacare. This claim did not originate with Levin. 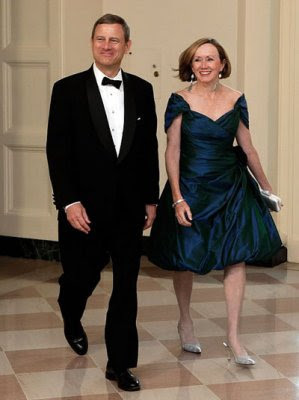 Various observers noted discrepancies in the opinions (e.g., Justice Ginsburg wrote as part of the "dissent"), including Senator Mike Lee, who clerked for Justice Alito. I asked if he thought these tactics may have influenced Roberts. What were the intimidation tactics used by the Left? 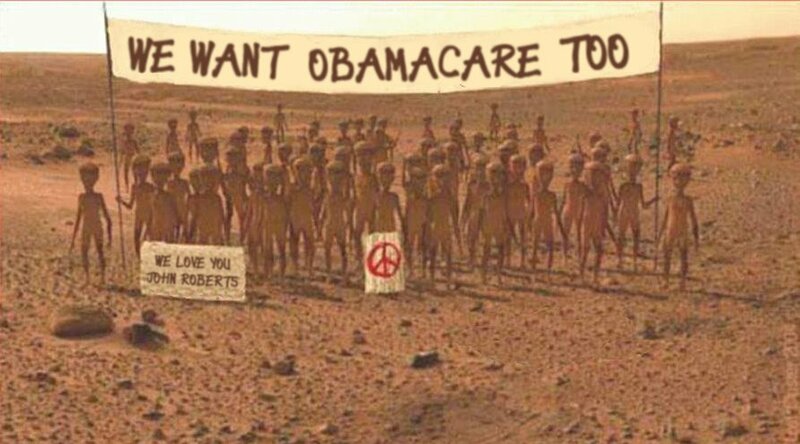 Democrats far and wide pinpointed Roberts as threatening the legitimacy of the Supreme Court would he have overturned Obamacare. • Sen. Patrick Leahy, self-admitted socialist from Vermont, was accused of trying to intimidate Roberts: "Leahy took to the Senate floor to warn the Supreme Court, particularly Chief Justice John Roberts, not to strike down the Affordable Care Act." • In April, Barack Obama threw in his two cents, asserting that the act of a Supreme Court in throwing out a law as unconstitutional would be "unprecedented" (note: of course it's not, it's occurred over 100 times in American history): "I’m confident that the Supreme Court will not take what would be an unprecedented extraordinary step of overturning a law that was passed by a strong majority of a democratically elected Congress." 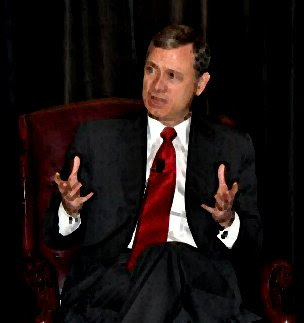 • Former Clinton administration official Robert Reich wrote: "The immediate question is whether the Chief Justice, John Roberts, understands the tenuous position of the Court he now runs." • New Republic legal affairs editor Jeffrey Rosen stated, "The health care case will undoubtedly define his chief justiceship." Given this as background, what possible reason would Roberts have for changing his mind at the last moment? ...a longtime pillar of the Washington legal establishment, a member of the ultra-posh Chevy Chase Club, and someone who acquaintances say cares deeply about how he is portrayed in the press. In this scenario, the combination of a man concerned with his image plus an unprecedented public intimidation campaign against Roberts, ultimately convinced him to change his vote. A conspiracy theory to be sure, but -- after all -- it's the Chicago Machine we're talking about. And the Obama administration and its various appendages haven't been shy about breaking new ground when it comes to presidential lawbreaking. Allowing thousands of military-grade weapons to fall into the hands of the Mexican drug cartels, presumably to build up public support for stricter gun control measures, isn't exactly playing patty-cake. Was a more serious and material threat directed at Roberts and his family? Another conspiracy theory revolves around a special "gift" to Roberts. Would a man fixated on joining an "ultra-posh" country club like, say, an extra $10 million to make his life easier and less stressful? Obviously, it's doubtful we would ever know. Using electronic funds transfer and offshore accounts, such a gift could be executed surreptitiously, protecting all parties from unwanted publicity. So which of the three options is it? Besides these three options, I see no other logical explanations for Roberts' late switch on the most important Supreme Court decision in a generation. Something was behind his flip. And I'm betting that something would be profoundly disturbing should the American people ever find out. ...The wiretap application disclosed that Fast and Furious suspects had already purchased nearly 1,000 firearms in Fast and Furious, that they had not been arrested, and that many of the weapons had already been recovered in criminal hands in Mexico. 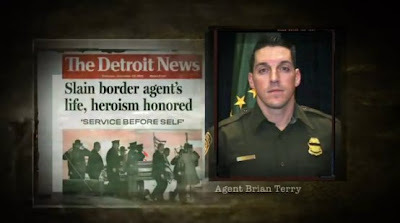 Nine months later, two weapons in the case were used in a shoot-out with illegal immigrants and the Border Patrol that ended in the death of Special Agent Brian Terry. 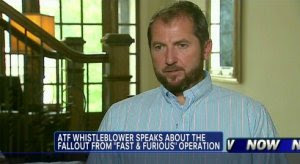 Two Fast and Furious whistleblowers have reportedly been placed under the supervision of an ATF official who allegedly threatened to "take them down." 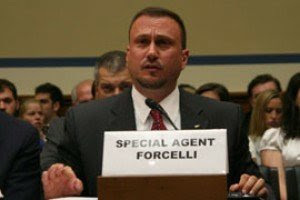 ...When the ATF whistleblowers, Special Agents John Dodson and Pete Forcelli, went public last year, Scot Thomasson headed up ATF Public Affairs. According to an eyewitness, Thomasson stated "We need to get whatever dirt we can on these guys (whistleblowers) and take them down." Now, Grassley and Issa say the agents have been put under the charge of ATF's Scot Thomasson who is Division Chief of the Firearms Operations Unit. 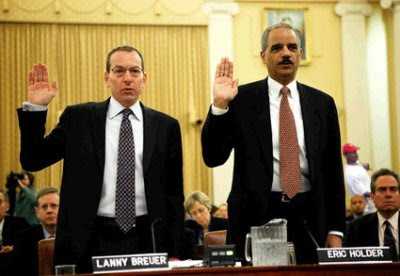 Thanks to heroes like Dodson and Forcelli, as well as true journalists like Sipsey Street Irregulars, Gun Rights Examiner and Sharyl Attkisson of CBS News, it will become increasingly difficult for vintage media to ignore the utter lawlessness of Eric Holder and his out-of-control DOJ. Oh, and as for the results of Holder's "internal investigation" by the DOJ "inspector general", which has been supposedly been underway since February 2011 -- 18 months, or 50 percent longer than the Warren Commission investigation into JFK's assassination -- not a single word has been forthcoming. 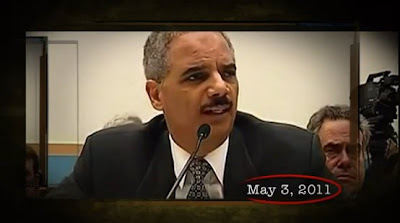 Rep. Issa: it's time to subpoena Holder's "inspector general" Cynthia A. Schnedar. It's time to find out what she knows and when she knew it. Or she can take the Fifth, which would tell us everything we need to know. 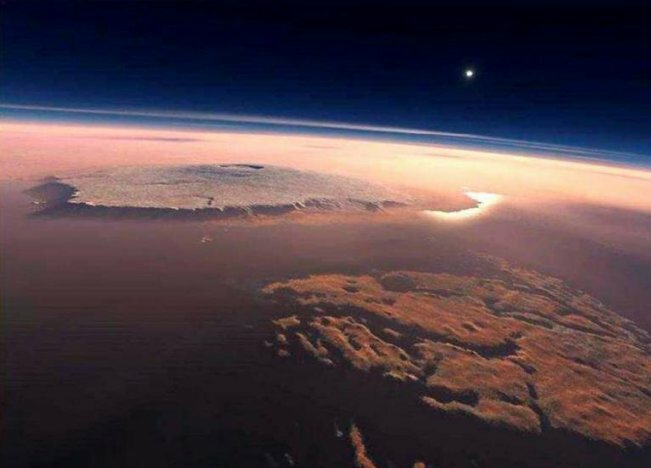 The pictures are great and the fact is that Mars has a canyon five times deeper than the Grand Canyon and a dormant volcano three times higher than Everest! Dude. It's Papa B. You shoulda known. Super: Chief Justice Roberts mocks conservative critics, jokes that he's leaving U.S. for "island fortress"
Yesterday Constitutional attorney Mark R. Levin rightfully excoriated John Roberts' ludicrous decision that saved Obamacare, which essentially rewrote the monstrous law in order to save it. 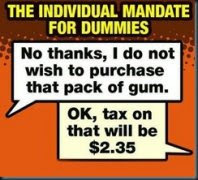 For one, Roberts magically ruled the Individual Mandate a tax, "a position that no lower court accepted". Facing a barrage of criticism from Constitutional experts, Roberts was on the defensive today, keeping himself in the spotlight and in good graces on the Beltway cocktail circuit. Chief Justice John Roberts joked today that he’ll escape to an 'impregnable island fortress' after opponents slammed him as a traitor for casting the decisive vote to uphold Barack Obama’s healthcare law. 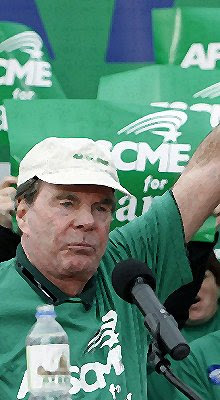 Responding to a question about his summer break, Roberts said he planned to teach a class for two weeks in Malta, the Mediterranean island nation. 'Malta, as you know, is an impregnable island fortress. 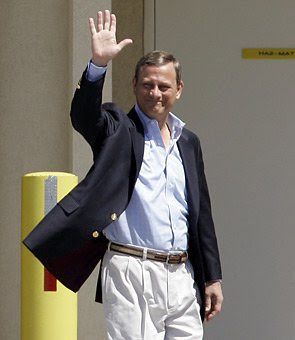 It seemed like a good idea,' Roberts said, drawing laughter from about 300 judges, attorneys and others attending a four-day conference Friday at a posh southwestern Pennsylvania resort. Roberts appeared today at a conference hosted by the Judicial Conference of the District of Columbia Circuit, one day after the Supreme Court said the federal government can require citizens to buy health insurance. ...The only direct question Roberts got about the landmark opinion upholding most key provisions of President Barack Obama's health care package came when those at the conference were invited to ask questions... That's when Roberts was asked what he thought his court's legacy would be in 50 years and 'how one recent opinion might fit into that' - an obvious reference to the health care decision. Lamberth hinted at the controversial decision when he asked Roberts if it bothered him that he can't respond to his critics. 'No,' Roberts said, his brief answer hanging in the air to more laughter. 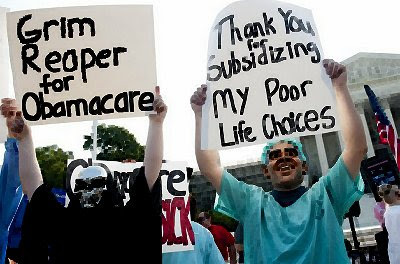 Opponents of Obamacare immediately lashed out at Roberts after the Chief Justice provided the crucial vote which led to the Supreme Court upholding the controversial law yesterday. ...Mr Roberts has been seen as a driving force behind a number of high-profile cases which have infuriated conservatives... The National Review Online published an editorial denouncing 'Roberts's Folly', arguing that the five judges who voted to uphold Obamacare had 'done violence' to the Constitution. ...Many liberals, by contrast, went out of their way to praise a man whose reputation with the left has never been very high. Democratic congressman Brad Sherman of California chimed in: 'Today I am proud to be a member of the Harvard Law School class of 1979, the class that included Chief Justice Roberts.' New York senator Charles Schumer said Mr Roberts had 'acted as the umpire he promised to be.' And left-leaning journalist Jonathan Chait wrote an article in New York magazine entitled 'John Roberts Saves Us All', praising the Chief Justice for avoiding a 'crisis of legitimacy' for the Supreme Court. 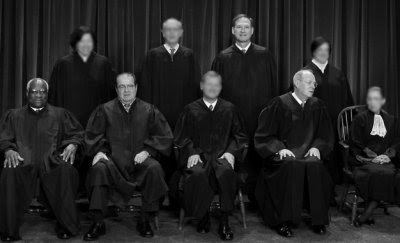 Unless we expand the conservative beachhead in 2010, crushing the Marxist Left in November, John Roberts could very well go down in history as the man who killed the Constitution. In the midst of a fiery floor debate over contempt proceedings for Attorney General Eric Holder, House Oversight and Government Reform Chairman Darrell Issa (R-Calif.) quietly dropped a bombshell letter into the Congressional Record. The May 24 letter to Rep. Elijah Cummings (D-Md. ), ranking member on the panel, quotes from and describes in detail a secret wiretap application that has become a point of debate in the GOP’s “Fast and Furious” gun-walking probe. The wiretap applications are under court seal, and releasing such information to the public would ordinarily be illegal. But Issa appears to be protected by the Speech or Debate Clause in the Constitution, which offers immunity for Congressional speech, especially on a chamber’s floor. After some searching, I was able to locate the actual details in the Congressional Record, which appear on pages H4409 through H4411 of Thursday’s official register. 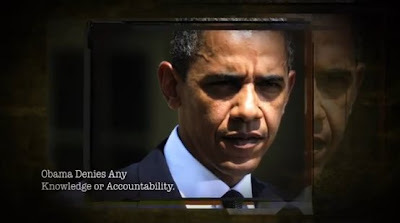 ...The wiretap affidavit reveals a remarkable amount of specific information about Operation Operation Fast and Furious. The affidavit reveals that the Justice Department has been misrepresenting important facts to Congress and withholding critical details about Fast and Furious from the Committee for months on end. QOTD: "Arizona bears the brunt of the country's illegal immigration problem. Its citizens feel themselves under siege by large numbers of illegal immigrants who invade their property, strain their social services, and even place their lives in jeopardy. Federal officials have been unable to remedy the problem, and indeed have recently shown that they are unwilling to do so. Thousands of Arizona's estimated 400,000 illegal immigrants -- including not just children but men and women under 30 -- are now assured immunity from enforcement, and will be able to compete openly with Arizona citizens for employment. [There's] a tidy unit of measurement called a "trillion." We can get our heads around the word "trillion," and so we think we understand what we're looking at. In this case, it is the size of our national debt. The thing is, it should be really hard to ever get our heads around a "trillion." Very few of us have ever seen a trillion of anything with our own eyes. 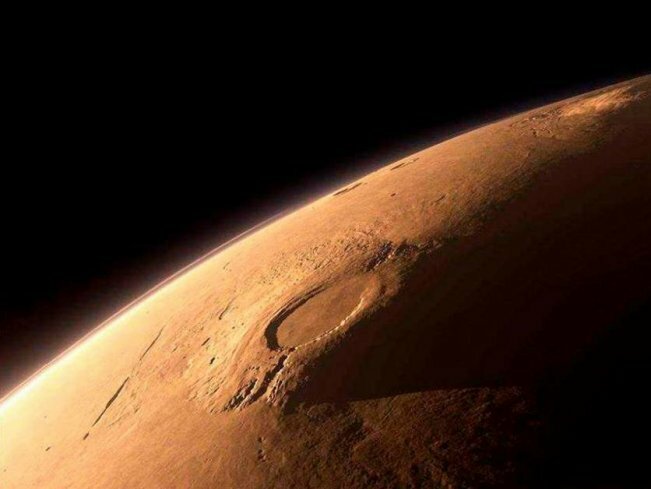 Maybe a trillion grains of sand, but not a trillion trees or a trillion stars. ...As a nation, we spent $3.6 trillion last year on federal government services, and about one out of every three of those dollars was borrowed. That's a lot of money. 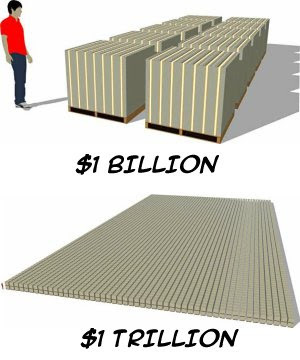 Just how much is a trillion dollars? Consider this: If you have a briefcase full of $100 bills, you'd have roughly $1 million. Few of us have ever seen that much money in one place, but we can at least imagine what it looks like. But a trillion dollars in $100 bills would weigh 22 million pounds! Things get more interesting if you stack the $100 bills on top of each other, rather than pack them tight in a briefcase. 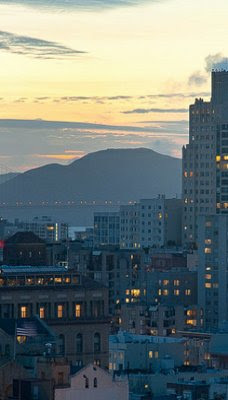 You'd have only $10 billion by the time you got as high as a commercial jetliner cruises. Think about that next time you're up in the air. 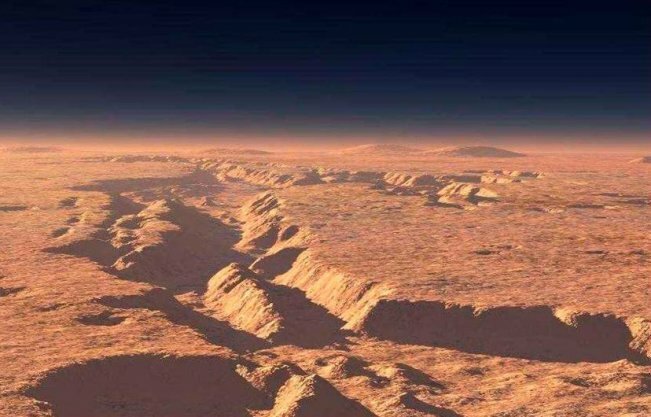 If you want to see a trillion dollars of those Benjamin Franklins, you need to penetrate the Earth's atmosphere and keep on going—678 miles high. Our national debt, at 15.8 times that amount, would form a stack of $100 bills 10,712 miles high. That's why this enormous number is trivialized by shortening it to a word that has only one more letter than its much more benign cousins, "million" or "billion." So let's ban the word "trillion." It's a unit of measurement neither understood nor appreciated. If we must use the number, we should give it its proper due. Write it out with all its zeros—all 12 of them. So $15.8 trillion would be $15,800,000,000,000. Or, from now on, if you want to say "trillion," say "one thousand billion" or "one million million," or "one thousand thousand thousand thousand." Our national debt, then, would go from $15.8 trillion to $15,800 billion. Doing this would show, among other things, that even cutting $100 billion from our debt would bring us down only to $15,700 billion. Still, "billions" doesn't quite cut it. One billion dollars used to be a lot of money. Today no self-respecting dictator siphons less than that amount into his or her Swiss bank account. It simply wouldn't look good among peer dictators. So what about expressing a trillion as "a million million"? By that standard, our deficit is now $15.8 million millions. We can't keep piling more debt onto our children or our children's children or our children's children's children. Otherwise, the million million millions in debt will make their future worthless, worthless, worthless. Not to worry: it's only the U.S. Commodity Futures Trading Commission that got hacked, which regulates the nation's derivatives market. The U.S. Commodity Futures Trading Commission, which governs the nation's derivatives markets, has disclosed that it suffered a data breach in May, exposing the Social Security numbers and personal information of its employees. According to a news report about the CFTC breach, an employee ath the commission received a phishing email on May 21 and input information into a fraudulent website. A third party was then able to illegally enter the employee’s account, which had access to personnel information, according to a copy of an email sent to agency employees that described the incident. "The email account contained emails and attachments with the names, Social Security numbers, and possibly other sensitive personally identifiable information of certain individuals," according to the email description. But I'm sure the hundreds of thousands of bureaucrats involved in health care will never click on a phishing email and expose Americans' most sensitive medical records. I found these brief statements (PDF), part of the dissent in today's ACA decision, to be far more terse, logical and compelling than all of the dozens of preceding pages. The Court today decides to save a statute Congress did not write. It rules that what the statute declares to be a requirement with a penalty is instead an option subject to a tax. And it changes the intentionally coercive sanction of a total cut-off of Medicaid funds to a supposedly non coercive cut-off of only the incremental funds that the Act makes available. The Court regards its strained statutory interpretationas judicial modesty. It is not. It amounts instead to a vast judicial overreaching. It creates a debilitated, inoperable version of health-care regulation that Congress did not enact and the public does not expect. It makes enactment of sensible health-care regulation more difficult, since Congress cannot start afresh but must take as its point of departure a jumble of now senseless provisions, provisions that certain interests favored under the Court’s new design will struggle to retain. And it leaves the public and the States to expend vast sums of money on requirements that may or may not survive the necessary congressional revision. The Court’s disposition, invented and atextual as it is,does not even have the merit of avoiding constitutional difficulties. It creates them. The holding that the Individual Mandate is a tax raises a difficult constitutional question (what is a direct tax?) that the Court resolves with inadequate deliberation. And the judgment on the Medicaid Expansion issue ushers in new federalism concerns and places an unaccustomed strain upon the Union. Those States that decline the Medicaid Expansion must subsidize, by the federal tax dollars taken from their citizens, vast grants to the States that accept the Medicaid Expansion. If that destabilizing political dynamic, so antagonistic to a harmonious Union, is to be introduced at all, it should be by Congress, not by the Judiciary. The values that should have determined our course today are caution, minimalism, and the understanding thatthe Federal Government is one of limited powers. But the Court’s ruling undermines those values at every turn. In the name of restraint, it overreaches. In the name of constitutional avoidance, it creates new constitutional questions. In the name of cooperative federalism, it undermines state sovereignty. The Constitution, though it dates from the founding ofthe Republic, has powerful meaning and vital relevanceto our own times. The constitutional protections that this case involves are protections of structure. Structural protections—notably, the restraints imposed by federalism and separation of powers—are less romantic and have less obvious a connection to personal freedom than the provisions of the Bill of Rights or the Civil War Amendments. Hence they tend to be undervalued or even forgotten by our citizens. It should be the responsibility of the Court to teach otherwise, to remind our people that the Framers considered structural protections of freedom the most important ones, for which reason they alone were embodied in the original Constitution and not left to later amendment. The fragmentation of power produced by thestructure of our Government is central to liberty, and when we destroy it, we place liberty at peril. Today’s decision should have vindicated, should have taught, this truth; instead, our judgment today has disregarded it. For the reasons here stated, we would find the Act invalid in its entirety. 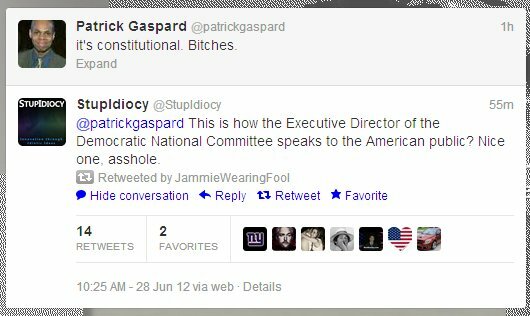 We respectfully dissent. I dissent for the reasons stated in our joint opinion, but I write separately to say a word about the Commerce Clause. The joint dissent and THE CHIEF JUSTICE correctly apply our precedents to conclude that the Individual Mandate is beyond the power granted to Congress un-der the Commerce Clause and the Necessary and Proper Clause. Under those precedents, Congress may regulate“economic activity [that] substantially affects interstatecommerce.” United States v. Lopez, 514 U. S. 549, 560 (1995). I adhere to my view that “the very notion of a ‘substantial effects’ test under the Commerce Clause is inconsistent with the original understanding of Congress’ powers and with this Court’s early Commerce Clause cases.” United States v. Morrison, 529 U. S. 598, 627 (2000) (THOMAS, J., concurring); see also Lopez, supra, at 584–602 (THOMAS, J., concurring); Gonzales v. Raich, 545 U. S. 1, 67–69 (2005) (THOMAS, J., dissenting). As I have explained, the Court’s continued use of that test “has encouraged the Federal Government to persist in its view that the Commerce Clause has virtually no limits.” Morrison, supra, at 627. The Government’s unprecedented claim in this suit that it may regulate not only economic activity but also inactivity that substantially affects interstate commerce is a case in point. Would that people who take an oath to uphold the Constitution actually read our nation's highest law, as well as the laws they vote to enact. Dare to dream, I suppose. Today's decision by the Supreme Court is a disgrace. This kind of madness is so far removed from America's founding that the Framers would be flabbergasted. They wrote the Constitution to prevent the rise of an autocratic, centralized federal government. Their aim was to protect the rights of the individual, above all. They carefully enumerated certain powers to the central government, leaving the remainder to the states and the people. But a series of petty, temporary politicians -- more invested in their own feudal power grabs and self-aggrandizement -- violated their oaths of office, decade after decade. 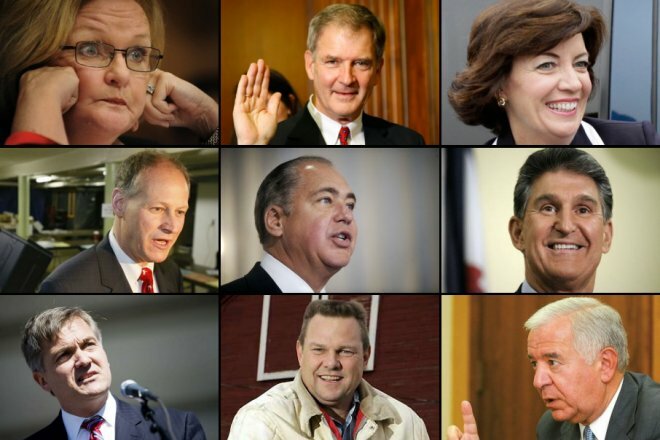 We have no choice but to politically crush these miscreants and replace them with true Constitutional conservatives. Spotted the following letter to the editor in today's Wall Street Journal. I have always known that a picture is worth a thousand words. It has never been more true than in observing the picture that accompanies Hillary Clinton's "Trade With Russia Is a Win-Win" (op-ed, June 20). 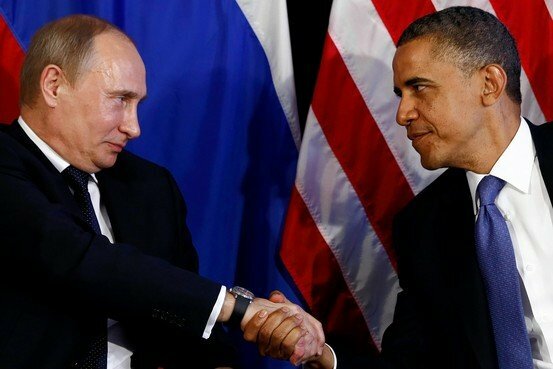 Presidents Vladimir Putin and Barack Obama are shown shaking hands, and Mr. Putin has clearly taken the power position. The Russian president has his hand on top, pointing down, while Mr. Obama's is on the bottom, pointing up. There is a nonverbal message being conveyed here, and I for one don't like the implication. Vince, this is easily explainable. The president can't bow while he's sitting down, for heaven's sake! 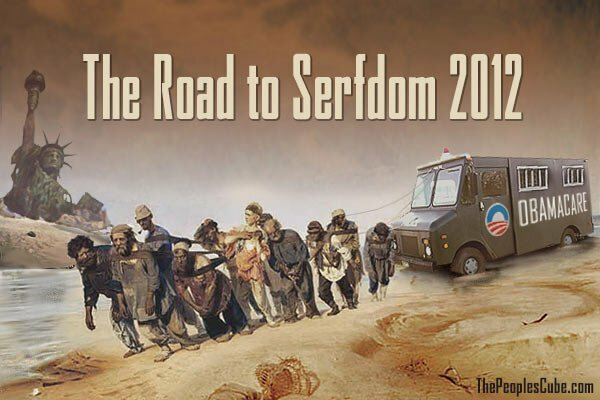 We gained a beachhead in 2010. It's time to take the cliffs. If you love the this country, if you love the Constitution, it’s November or never to save both. QOTD: "As though we needed any more evidence, President Obama has demonstrated anew his utter disregard for the safety and security of the Arizona people. Within the last two hours, I have been notified the Obama administration has revoked the 287(g) agreement under the authority of which Arizona law enforcement officers have partnered with the federal government in the enforcement of immigration law. Of course, it is no coincidence that this announcement comes immediately on the heels of the U.S. Supreme Court’s ruling upholding the constitutionality of the heart of Arizona’s anti-illegal immigration law: SB 1070. It’s worth noting that 68 law enforcement entities in 24 states have functioning 287(g) agreements with the federal government. But it appears the only agreements eliminated today were those in Arizona, the state that happens to be on the front lines of America’s fight against illegal immigration. We are on our own, apparently. In fact, it's now running ads across the U.S. (PDF) to encourage more use of food stamps. 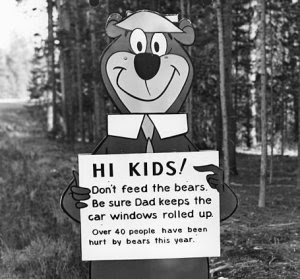 Meanwhile, the National Park Service, administered by the U.S. Department of the Interior, asks us to "Please Do Not Feed the Animals." The stated reason for the policy is because the animals soon grow dependent on handouts, forget how to fend for themselves, and starve to death if nobody is there to feed them. These results are certainly apropos of any "financial reform" bearing the names of Barney Frank and Chris Dodd. It is rare that a single law can have a significant adverse effect on the enormous U.S. economy. 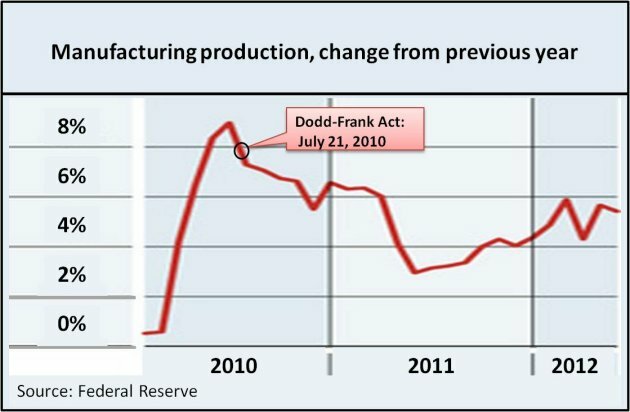 But there has never been anything like the Dodd-Frank Act. 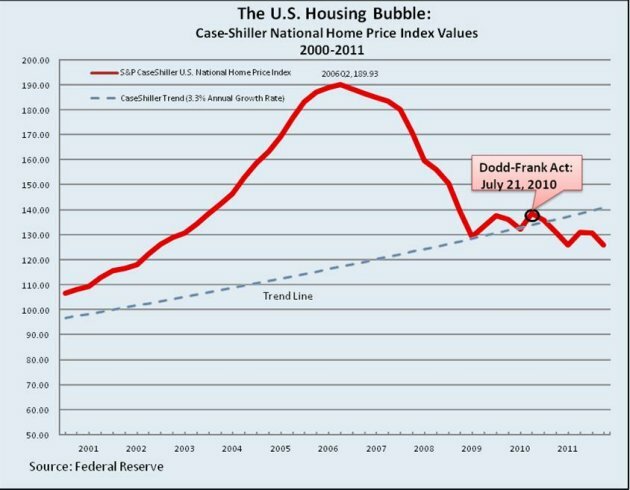 Signed into law by President Obama on July 21, 2010, its extraordinary effect in slowing the economy is coming into focus as its second anniversary approaches. 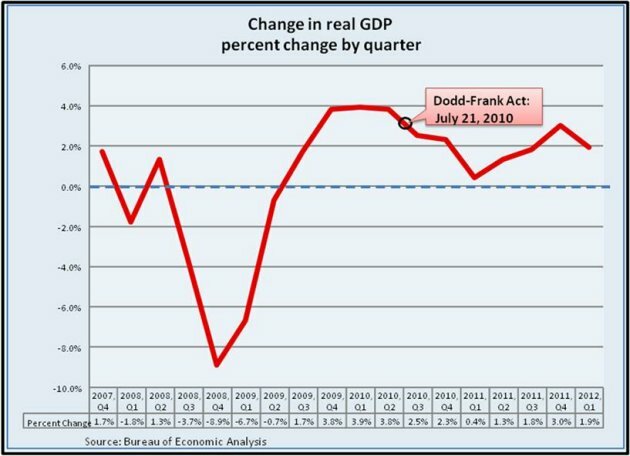 As shown in the chart below, the U.S. economy had a few reasonably good quarters of recovery after the crisis, particularly the third and fourth quarters of 2009 and the first quarter of 2010. These were not of Reagan quality, of course, but they suggested that the economy was beginning to heal. 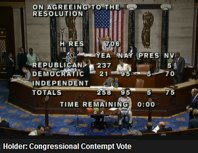 On June 30, 2010, however, the Democrat-controlled House voted along party lines to adopt the House version of Dodd-Frank. That was expected, of course, but two weeks later two Republican Senators—Scott Brown of Massachusetts and Olympia Snowe of Maine—announced they would vote for cloture in the Senate. These two votes virtually assured that the bill would pass the Senate and eventually become law. Almost immediately, GDP growth in the third quarter of 2010 began to slow. It has never recovered. In short, like Fannie Mae, Freddie Mac, Social Security, Medicare, "Great Society" and every other enormous, failed government program, Dodd-Frank is guaranteed -- that's right, I said it: guaranteed -- to fail. One day, hundreds of years from now, historians will look upon this era's Democrat Party with amazement. 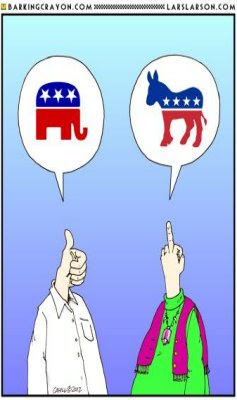 How could any political party, they will ask, continue to pile program upon program without seriously evaluating the results of their prior failures? The answer is simple. In their craven, white-knuckled death grip on power, Democrats are willing to promise anything, no matter how destructive it will be to society as a whole. After all, it could be a social-engineering attack. McAfee and Guardian Analytics have revealed the results of a months-long study that uncovered a global financial services cyber-crime operation. "Operation High Roller" targeted the online banking accounts used by high-net worth individuals and companies. The attacks ranged from the EU, to Latin America, and most recently to the U.S. All sizes of banks were targeted, from global institutions to local credit unions. As for the size of the thefts: "the total attempted fraud could be as high as €2 billion." – The page contains a blackhole exploit kit or other similar framework. The kit will look for an appropriate vulnerability in the victim’s browser, and upon finding one, will load exploit scripts that compromise the victim’s computer. – The exploit script installs a Downloader Trojan. – The Downloader Trojan then will install SpyEye or Zeus on the victim’s device. 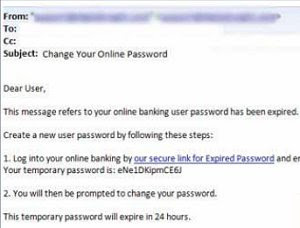 • The injected script takes control of the session and contacts the fraudsters’ server for specific instructions. It may insert content within the session, such as a transaction field or error message. For example, as the victim logs in, he may be asked to answer a security question and get an error. The error message creates the delay that allows the fraudster’s software to perform the transaction. 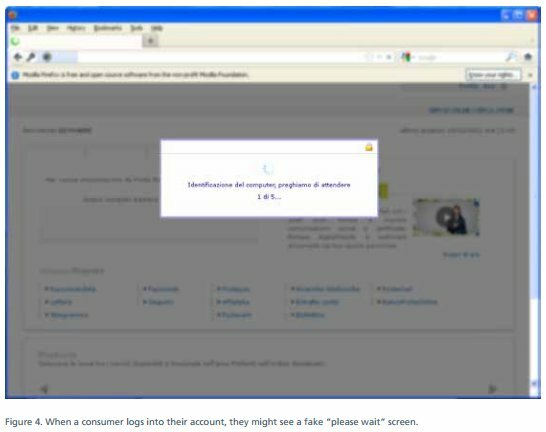 • At this point the victim has not actually authenticated and typically is stalled with a “please wait” message for about 60 seconds (see Figure 4). – The malware collects the TAN from the victim’s screen and presents the authentic TAN to the financial institution to enable the fraudulent transaction, while delaying the victim from accessing their account. – The malware uses the intercepted credentials to initiate a silent, separate transaction to a mule account (either individual or business) or in one case, a prepaid debit card. – The malware looks up a valid mule account from a separate database, automating a traditionally manual step in the process. The transaction is performed in a hidden iFrame, a parallel instance of the online banking session on the client that operates in the background. The code navigates to the transaction page and initiates an automated form submission that adds the mule information. • The mule withdraws the money and converts it to a Western Union or Liberty Reserve payment that he remits to the fraudster. The mule retains a small percentage of the take, and the money is untraceable within a few days. 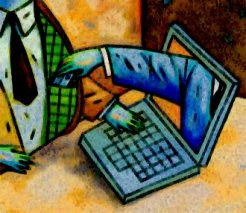 • To conceal the theft, the malware will stay resident in memory on the victim’s computer. It will alter the victim’s bank statement to show a false balance, remove line items associated with the transaction, and block printing of statements that would show the true account balance and transaction sequences. Put simply, don't click on any email you don't have 100 percent confidence in. Even one from me. After negotiations with public sector unions and bondholders collapsed, the city of Stockton, California announced that it will file for bankruptcy. Mike Shedlock says that the real reason for cities' burgeoning financial troubles revolve around unattainable pension promises, which he calls "a death trap for cities." 1. The immediate solution is bankruptcy. Expect to see more cities file. However, longer-term structural problems must also be addressed. 2. Untenable pension contracts need to be tossed out by the courts and benefits reduced. Every taxpayer not on the public dole should cheer bankruptcy, not resist it. 3. End defined benefit pension plans for public union workers. 4. End collective bargaining for public union workers. Governor Scott Walker in Wisconsin has proven that can be done. 5. Scrap Davis-Bacon and all state prevailing wage laws. 6. Institute national right-to-work laws. 9. Scrap student loan programs that only benefit administrators and educators, not the kids. It's time to stop overpaying for all government-sponsored services including but not limited to police, fire, prison-workers, and education. The vicious, self-serving grip that unions and their political supporters have on this nation has to end. Governor Walker partially paved the way in Wisconsin. Other states must follow through. At the national level, we desperately need right-to-work laws while ending prevailing wages. More and more municipalities -- unable to print money like their federal cousins -- will have to declare bankruptcy and wipe the slate clean. Because sooner or later, the laws of mathematics will win out. Related: A Brief, Illustrated History of the Public Sector Unions That, Together With The Democrat Party, Are Waging War on the Taxpayer. That's right: they're all Democrats. And they're all skipping the Democrat National Convention. If we used the "logic" of the Left (e.g., "The Rotting Racist Underbelly of the Tea Party Protests*"), it's clear that racism is the underlying problem with the DNC defectors. * Never mind that that the Tea Party binds people of every race, creed, religion and color to protect the sovereignty of the individual. Never mind that the Tea Party and Constitutional Conservatives embrace the only system of human governance proven to offer more tolerance, more opportunity, and more freedom than any other system in history.